Winter is going fast! But winter still exists in my painting on display at Isaac’s Way Restaurant in Fredericton. The painting is one of 70 original art pieces in the 32nd Art Auction, raising funds for music lessons for kids-in-need. My painting ‘farmyard in moonlight’ is 24″ x 20″, acrylic, unframed, gallery edges. The high bid right now is $100. You can buy it off the wall for $320. Half of the price goes to the charity. You can see the other painting in the auction by visiting Isaac’s Way and enjoying their great menu. Or see the paintings on-line at 32nd Art Auction. One of my favorite covered bridges is the Malone Bridge (Kennebecasis #23) near Upper Goshen in Kings County, New Brunswick. The painting ‘thistles at Malone Bridge’ is 24 inches wide by 20 inches high, done in acrylics, gallery edges. My painting ‘thistles at the Malone Bridge’ is part of Isaac’s Way Restaurant’s 31st Art Auction. The Auction closes January 28, 2018 – silent-auction-type bids are taken until then, or you can buy the painting anytime up to the close of the auction for its full price of $320. 50% of the proceeds from my sale are donated to ART lessons for kids-in-need. If you love covered bridges and would like some original art for your home, drop by and have a look at my work or call Isaac’s Way at 506-474-7222. Just before Christmas, my painting of the Ellis Bridge over the North Becaguimec River sold. Since I want to keep a painting in the space, I have been working on a new covered bridge painting. For subject matter, I chose the Malone Covered Bridge near Goshen, the same covered bridge in the painting on the front cover of my book. The Malone Bridge is in an isolated area and was one of the favorite bridges we visited in 2015. One of the sketches in my book ‘in the shelter of the covered bridge’ is of the Malone Bridge and I used this sketch as the basis for my new painting. Malone Bridge, on the isolated Goshen Road near Upper Goshen in Kings County, was built in 1911. The remnants of the Malone homestead, established 1820, are located near the bridge. At this point the Kennebecasis is a narrow, clear stream. The two brooks that seem to come together at the bridge are actually two braids of the same river. … (from ‘in the shelter of the covered bridge’, Chapel Street Editions, 2017). The painting will be at Isaac’s Way Restaurant in Fredericton, New Brunswick until January 28, as part of their 31st Art Auction. Silent-auction-type bids are taken until January 28, 2018, or you can purchase the painting for its full price of $320. The art is viewed by everyone enjoying a meal at the restaurant and 50% of the proceeds from my sale are donated to ART lessons for kids-in-need. If you love covered bridges and would like some original art for your home, drop by and have a look at my work. We are approaching the end of the Isaac’s Way Summer Art Auction #27 in Fredericton, New Brunswick. The Art Auction is raising funds for MUSIC lessons for kids-in-need. The last day for bidding on or buying a painting is Sunday evening September 25th, 2016 at closing time. My painting in this Art Auction is of a brilliant sunrise behind our grey woods. The painting, entitled ‘morning sky’, is 24″ wide by 20″ high, acrylic with gallery edges. I am donating 50% of the proceeds from my painting to the charity. On May 27, 2016, the 26th Art Auction and Sale at Isaac’s Way Restaurant in Fredericton, New Brunswick will come to an end. Only a few more days to own some reasonably-priced art and contribute to a charity for children. For a look at the paintings still available, visit http://isaacsway.ca/art/. My painting in the 26th Art Auction and Sale is a landscape of the Saint John River as viewed from the Nerepis Marsh. It is entitled ‘across the bay’ (24” wide by 20” high, acrylic on canvas, unframed with gallery edges). The current bid is $100. I donate 50% of the proceeds to Isaac’s Way Kids-in-Need. To make a bid on this or other paintings, just drop in at Isaac’s Way in Fredericton or call 506-474-7222. My submission to the next (the 27th!) Art Auction and Sale is of a brilliant sunrise behind our grey woods. The painting, entitled ‘morning sky’, is 24″ wide by 20″ high, acrylic with gallery edges. This auction will run from May 27, 2016 to late September 2016. The proceeds from the auction will go to sponsor Kids-in-Need for music lessons and I am donating 50% of the proceeds from my painting to the charity. My next submission, for the Isaac’s Way 26th Art Auction and Sale, is a landscape. The piece features a view of the Saint John River, from the Nerepis Marsh at Grand Bay-Westfield towards the Westfield Ferry. It is entitled ‘across the bay’ (24” wide by 20” high, acrylic on canvas, unframed with gallery edges). This auction will run from January 27, 2016 to late May, 2016. The proceeds from the auction will go to sponsor kids-in-need. I am donating 50% of the proceeds from my painting to the charity. I have submitted another painting to Isaac’s Way Restaurant, for their 25th Art Auction and Sale. This event will run from September 27, 2015 to late January, 2016. The proceeds from the auction go to sponsor kids-in-need. My latest painting is titled ‘Outside-In #3 – Far from the Sea’. 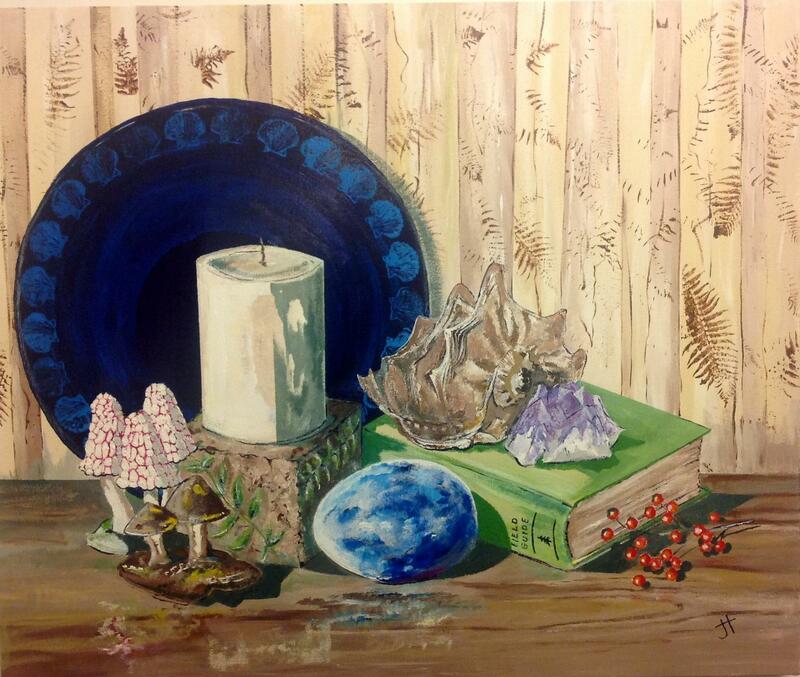 The painting is the third in a series of still life paintings I have done about the many elements of nature we bring into our homes. This includes items collected on walks, motifs on fabrics and metals, small statuary and so on. 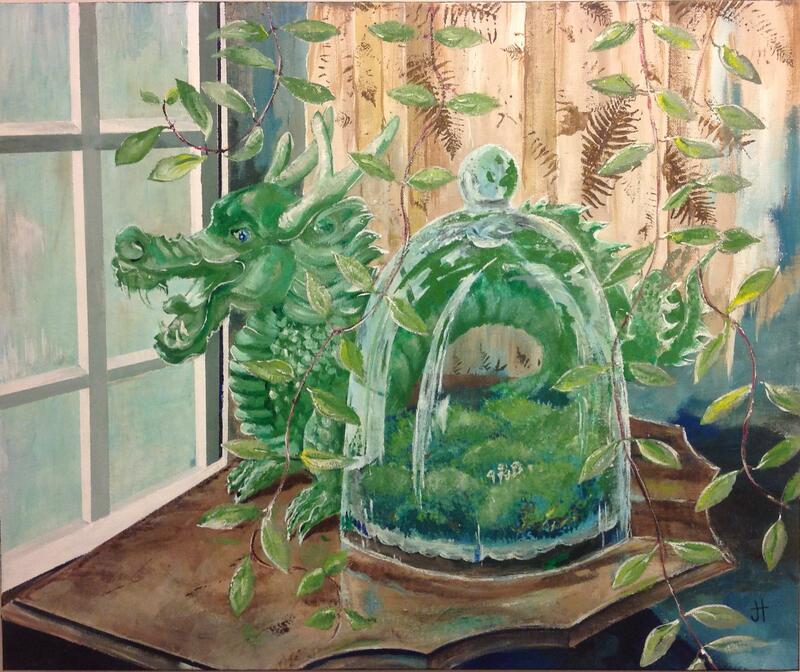 My first painting in the series was ‘Outside-In’, a Chinese dragon hiding behind a glass cloche. 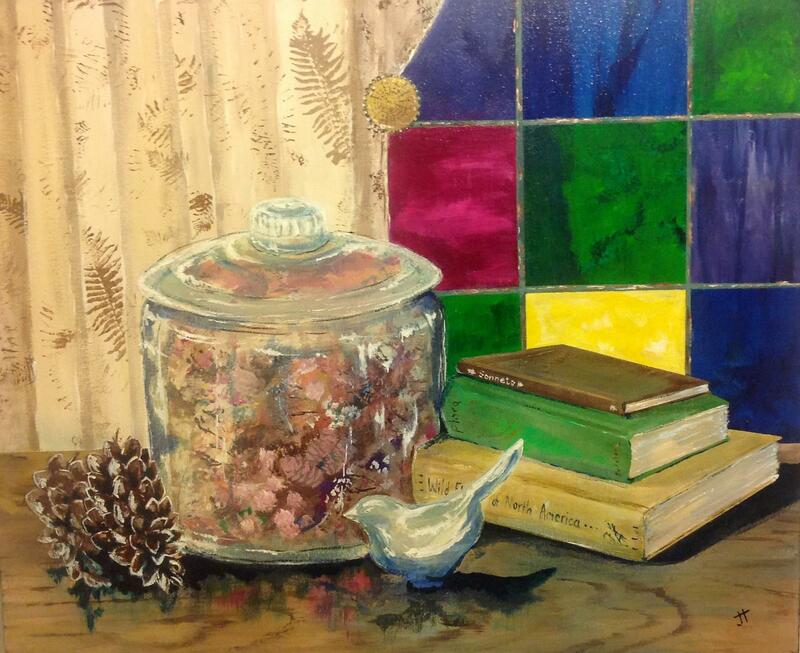 The second painting was ‘Outside-In #2’ , a still life of a potpourri jar. For the new painting, I used Chromium Oxide Green, Burnt Umber, Titanium White, Phthalo Blue, Cadmium Yellow, Quinacridone Magenta and Cadmium Red. If you are in the Fredericton area, please drop in to Isaac’s Way. Their food is delicious and over fifty artists have their paintings on display. Bid and you could take home a piece of original art!